I know Qing Ming (paying respects to your ancestors a.k.a "ancestor worship") & a baby's 1st month by not seem to be the most normal topics to put together. But they happened to be on the same day & I've always found Qing Ming to be quite a happy event actually, because the family comes together & we normally just make jokes about burning paper iPhones & paper laptops for our ancestors. And I was wearing flats (instead of slippers) since I was attending Dashiel's party after that, so my flats got soaker through & my toes were absolutely freezing! T_T Also note the skirt tucked into the waistband. To put it simply, SKY Y U RAIN THAT DAY?! 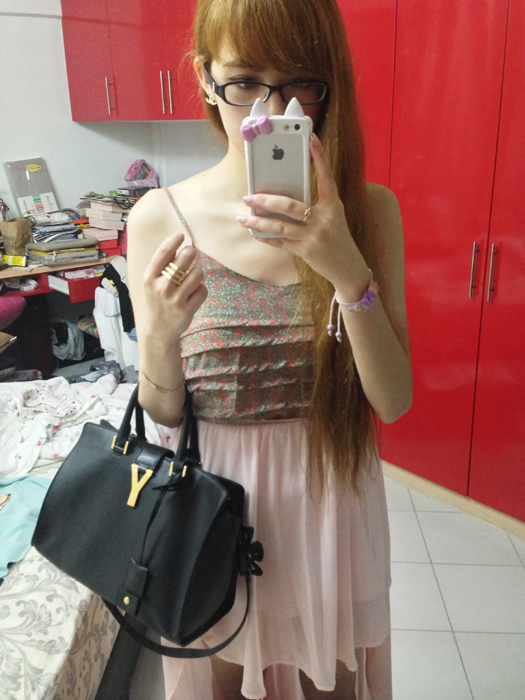 OOTD; dresscode was very naturally... pink (& it turns out I have very few pink items). Haha. In case you didn't know, Wendy's birthday is around the same time as Dashiel's 1st month so mother & son were able to celebrate together! In fact the plan was that she would think it was entirely for Dashiel, but we would surprise her with a birthday party for her as well with her own friends & family. I dropped by town first to buy balloons! The 2 Hello Kitty ones were for Wendy while the Birthday Prince one was for Dashiel. Super cute strawberry shortcakes (Wendy's favourite) decorated with letters & Dashiel's face! HAHA this one is even cuter! A myriad of grumpy Dashiel expressions! This baby has so many faces. In case you couldn't tell, the cafe/shop is all about arts & craft! If I'm not wrong, families pay for a certain amount of time there to use the arts & craft supplies with their kids. Unfortunately I really can't remember what this place is called :/ I just know it's in the Arab Street area! The star of the day (& every other day) happily snoozing basically... the entire time. So no one really got to play with Dashiel that day lol. And while I'm at it, here are some older pictures of Dashiel! Omg he already looks so different now (check out Wendy's Instagram @xiaxue)! Below is him at 1 month old! This was back when he always had this disapproving/suspicious face & it was so cute haha. We used to joke that he was like me, a.k.a always "meh" & unimpressed by things hahaha. But now at 5 months old he's a much more cheerful & smiley baby! To many more birthdays for both Dashiel & Wendy! 5 comments on "Qing Ming & Dashiel's 1st Month"
Qing ming in September? I thought it is usually somewhere in April. Ha ha, I love how Mike is craning his neck to get in the picture. Everything is looking amazing. The card is made with lot of creative ideas and it is a very nice gift. I loved the idea of making the cupcake. it is decorated so beautifully. The photograph having so much innocence and cuteness is looking wonderful in decorating the cupcake. Everything is looking very creative and ice. Recently i celebrated my daughter's birthday and we kept a barbie doll theme. It was also looking wonderful.